Friday was the most important day of the week - the day of the Gourmet Garden Blog Off Cook Off. The nine Australian bloggers would compete for the title 'best blogger / chef' and win a 12 month ambassador programme with Gourmet Garden. An international winner would then be chosen from the Australian winner, Alberto and myself, already winners in Spain and the UK respectively. It wasnt a great start to the day for me. I ran for the minibus with a take away coffee after about 2 hrs sleep. It seemed half of Noosa were singing Phil Collins songs outside my window until the wee hours. However, The excitement of the cook off seemed to counteract the tiredness. 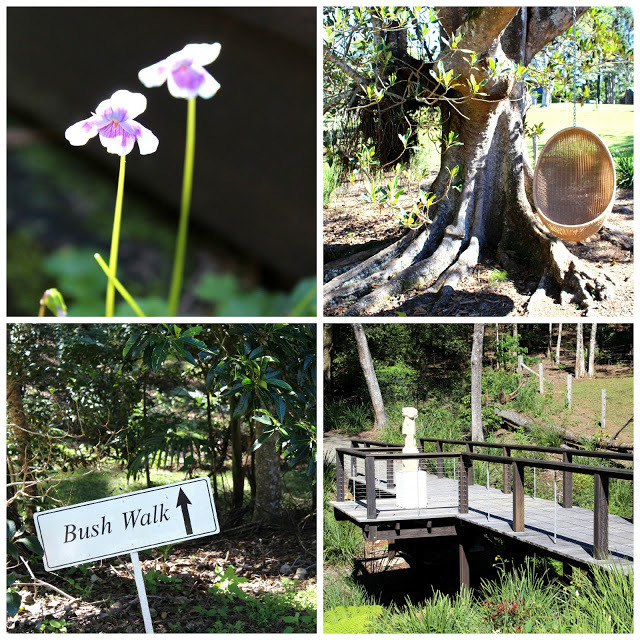 I had a really great chat with the lovely Carolyn from Desire Empire on the way to Spicers Tamarind Retreat in Maleny (who also let me use her lovely photos above). The weather was spectacular and the venue for the cook off was stunning. The kitchen overlooked a beautiful garden, with rolling hills, trees and grazing ponies. As space was limited in the kitchen, we were split into three groups to cook. Carolyn, Alberto, Amanda V and Lisa were up first. Carolyn made Ginger Chicken with Lemongrass, Almonds and Snow Peas presented beautifully in a shell. Alberto made a traditional Spanish chilled soup, Salmorejo, (which is completely amazing). Amanda made incredible Fish Tacos with all the extras and Lisa made a gorgeous Herbed Risotto with Scallops and a Chorizo Crumb. Jay, Amanda S, Anne and Laney were next. Jay made a scrummy Ginger Pudding and Amanda a Fragrant Asian Fishball Noodle Soup. Anne's dish was just divine, a Pear, Thyme and Ginger Cake with Walnut Praline and Ginger Custard. Laney made a Courgette Quiche with a Pancetta Crust, which was clever and creative. Huge thank you to Lisa at Bake Blike Blog for allowing me to use all her brilliant food photos! Tam, Margun and myself were in the last group. Margun’s Crispy Baramuni with Herbed Hollandaise Sauce and Curly Fries was stunning, like something from Masterchef. Tam made an impressive Filled Tortillini with homemade pasta, from scratch, in a Pumpkin Sauce. I made Piri Piri Chicken with Sweet Potato Chips. Sammy & Bella were back again - hooray! This time they were here to judge each dish and choose the winners. As we cooked they came around, tasted the food, asked questions and gave little tips. My finished Piri Piri Chicken and Sweet Potato Chips. The actual cook off went relatively smoothly for me - apart from the piri piri sauce, which went a bit wrong at the end. For some reason it tasted completely different to how it does back home, but I got there in the end with a few last minute tweaks and plated up with seconds to spare. I made a right old mess of the kitchen. We each had our photo taken with our dish before heading over to a lovely restaurant next to the cookery school. We enjoyed some drinks and nibbles while the judges made their decisions. Laney with her winning dish - Courgette Quiche with Pancetta Crust. Laney from Crash Test Mummy was the Australian winner with her dish, Courgette Quiche with Pancetta Crust. I'm not a huge fan of pastry in Quiche, I find it a bit greasy, so I thought this was a really clever twist. Me with the lovely Sammy (left) and Bella (right). When they announced the international winner was me I was blown away. Sammy & Bella said really nice things about my Piri Piri Chicken and Sweet Potato Chips. I couldn't help but feel slightly emotional when they have me my flowers. I'm totally amazed at how far I've come with the blogging over the past three years, it's really humbling. It was a sad farewell to all my Aussie friends after the cook off and we had lots of hugs. We had got so close in just three days. Being mummies and food bloggers meant we have lots on common, even if we're on the other side of the world to one another. I dearly love all the bloggy friends I made down under, and we'll definitely keep in touch. The final photo of all the bloggers with Sammy & Bella. Back row left to right: Jay, Margun, Tam, Lisa, Amanda S, Alberto, Anne, Carolyn, Amanda V. Front row left to right: Bella, Me, Laney, Sammy. Here's a little video I made of the day. Sorry the sound is a bit quiet right at the end. Enjoy!